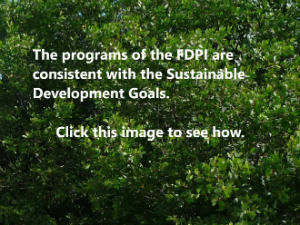 The Foundation for Development Planning, Inc (FDPI) is subject to the provisions of Title 13, Chapter 3 of the Virgin Islands Code, which deal with nonprofit corporations. The Articles of Incorporation for the Foundation also includes specific reference to the provisions of Section 501(c)(3) of the Internal Revenue Code of 1954. The main legal instruments that determine the purpose of FDPI and its operational procedures are the Articles of Incorporation and the By-laws. Alida Ortiz-Sotomayor (Ph.D.) is a retired professor of biology from the University of Puerto Rico, Humacao. Dr. Ortiz-Sotomayor has dedicated most of her professional life to the promotion of marine literacy and education among teachers and non-scientists. She has collaborated with other educators in the production of teaching materials on coral reefs and related ecosystems for K-12 students and personnel in marine protected areas in the Caribbean. She has also served as a consultant to regional and international organizations for development and delivery of capacity building programs in integrated coastal areas management, marine protected areas management, and environmental protection practices in hotel operations. Dr. Ortiz-Sotomajor continues her teaching and mentoring roles as a Graduate Lecturer at the Metropolitan University, San Juan, Puerto Rico. Dr. Ortiz-Sotomajor served in several administrative roles during her tenure with the University of Puerto Rico, ranging in responsibilities from Director of the UPR Sea Grant Marine Program to Dean of Academic Affairs, Humacao University College, and Special Assistant to the President of the University of Puerto Rico. She has also served on the Advisory Councils of the Puerto Rico Conservation Trust, the Science and Engineering Education Division of Oak Ridge Associated Universities, and Subaquatic Archaeology. Her current board roles include President of Consultores Educativos Ambientales C.S.P. and Chairperson of the Outreach and Education Panel of the Caribbean Fishery Management Council. Lloyd Gardner is an environmental planner who has been involved in environmental management in the Caribbean for more than 35 years. Mr. Gardner’s experience spans both the public and private sectors, starting with the Government of Jamaica in 1982. During his tenure with the Government of Jamaica, Mr. Gardner served on several national development committees and the Board of Directors of the Negril Green Island Area Local Planning Authority. Since joining the private sector as an environmental planning consultant in 1992, Mr. Gardner has provided consulting services to a wide range of regional and international private, inter-governmental, civil society, bilateral, and multilateral organizations. Mr. Gardner maintains active involvement in regional and international non-governmental organizations, such as the Natural History Society of Jamaica, Caribbean Conservation Association, and IUCN World Commission on Protected Areas. His involvement in these organizations has included contributions at the level of Executive Committee, Regional Steering Committee, and Board of Directors. Noreen Michael (Ph.D.) is currently Research Director of the Caribbean Exploratory NIMHD Research Center and Research Associate Professor in the School of Nursing, University of the Virgin Islands. Dr. Michael previously held various research and administrative positions in academia and the public sector, including; Program Associate at the Center for Educational Testing and Evaluation (University of Kansas), Coordinator of Research for Assessment of the Status of Minorities in Education (Illinois State University), Director of Health Statistics within the Virgin Islands Department of Health, Consultant to the Missouri Department of Elementary and Secondary Education and The Village: Partners in Recovery, and Commissioner of the Virgin Islands Department of Education. With a doctoral degree in Educational Psychology, Dr. Michael was a member of faculty of the Louisiana State University, the University of Kansas, and the Illinois State University. Dr. Michael has served on various boards and commissions within the U.S. Virgin Islands, including; Board of Directors of WTJX, University of the Virgin Islands Board of Trustees, Board of Directors of the U.S. Virgin Islands Research & Technology Park, the U.S. Virgin Islands Medical Commission, University of the Virgin Islands CELL Advisory Board, VI-EPSCoR Advisory Board, Board of Directors of the Beacon Schools, Board of Directors of the St. Croix Chapter of the American Cancer Society, and Board of Directors of the Virgin Islands Community AIDS Resource, Inc (VICARE). Michael E. O’Neal (Ph.D.) is currently a director of JOMA Ltd, a family-owned real estate management and development company in the British Virgin Islands. He also serves as Senior Research Fellow at Island Resources Foundation. Dr. O’Neal holds postgraduate degrees in anthropology and an undergraduate degree in economics and business administration. Prior to his academic career, Dr. O’Neal was a managing director of the business enterprises of J.R. O’Neal Ltd (BVI). His academic career includes senior positions, such as; Core Professor at the Graduate College of the Union Institute in Ohio, Resident Tutor/Head of the University of the West Indies-BVI Centre, and Vice President and President of the H. Lavity Stoutt Community College (British Virgin Islands). Though returning to the private sector in 2009, Dr. O’Neal maintains his research interests in the fields of political economy of development, medical anthropology, and family business studies. He is a member of several professional associations and learned societies, a Fellow of the Royal Anthropological Institute (U.K.) and the American Anthropological Association, and he is a published author. Dr. O’Neal has served on several boards and commissions, including; the British Virgin Islands Public Service Commission, the Development Bank of the Virgin Islands, and as Chairman of the Board of Directors of the British Virgin Islands National Parks Trust. Selena Tapper has more than 25 years of experience in development work in the Wider Caribbean Region. During that time, she held various field and administrative positions responsible for program development and administration, fund management, and capacity development for community, national, and Caribbean regional organizations. Ms Tapper managed development support programmes for the Caribbean Conference of Churches, CUSO (an Ottawa-based, nonprofit, Canadian organization), and the Caribbean Educational Programme in Agricultural Technology (University of the West Indies). Ms Tapper also served as the Executive Director of the Environmental Foundation of Jamaica during the period 1998-2003, where she was responsible for administration and management of a capital fund of US$24 million, established for the purpose of financing environment and child development projects. Ms. Tapper was a Founding Board Member of the Association of Development Agencies, Jamaica. She also served on the boards of directors of the Jamaica Social Investment Fund and Projects for People Ltd. (Jamaica). Spencer Thomas (Ph.D.) is a business consultant who, with postgraduate degrees in economics and telecommunications regulation and policy, currently serves on the board of directors of private firms and non-profit organizations, and as a policy advisor to the Government of Grenada. Dr. Thomas has held numerous leadership positions in the Government of Grenada, including roles such as director general/permanent secretary, economic policy advisor, chair of national development initiatives and national councils, lead negotiator in international multilateral environmental agreements, and national focal point for a number of international programs. He has served, and continues to serve, on the boards of public corporations, private firms, international non-governmental organizations, and regional development banks. As a consultant, Dr. Thomas has conducted studies and provided advice to a range of regional and international development organizations in the areas of national development strategy and planning, strategic business planning, socio-economic and economic assessments, value chain analyses, information and communication technology policy and regulation, and energy. Dr. Thomas has considerable experience in international sustainable development programs, particularly in the areas of information and communication technology, environment, and trade. His current roles include Ambassador and Special Envoy for Multilateral Environmental Agreements for the Government of Grenada; Member of the Country Code Name Supporting Organisation (ccNSO)-ICANN; Member of the Intergovernmental Science-Policy Platform on Biodiversity and Ecosystem Services; Member, Steering Committee, Global Island Partnership for Biodiversity; and Member, Steering Committee, 2010 Biodiversity Indicators Partnership, UNEP/WCMC. Yvonne Webster-Pryce has considerable experience in business administration, including executive level positions in the private and public sectors. Executive positions in the private sectors include Cable and Wireless (W.I.) Limited Anguilla, International Motors Corporation, and Tony’s Wrecking Service. Executive positions in the public sector include tenures at the Virgin Islands National Guard, Virgin Islands Department of Health, and most recently, Director of Administration in the Virgin Islands Department of Labor (2002-2015). Ms. Webster-Pryce has served on the board of directors of the Virgin Islands Agriculture and Food Fair for the past 16 years, including being a member of its finance committee. Persons wishing to be associated with the Foundation in carrying out its objects and purposes may be appointed by the Board as non-voting Associates of the Foundation, provided that such persons agree to abide by the Articles of Incorporation, By-laws, and other policies, rules and standards of professional conduct established by the Board. Similarly, the partnership agreements with other organizations are subject to the by-laws and policies of the Foundation. Dr. Barbara Lausche is an international environmental lawyer and policy adviser with more than thirty years of experience with governments and organizations around the world. Her work has concentrated on conservation aspects of environmental law, compliance with international conventions, and marine and coastal environments. She has authored or co-authored numerous peer-reviewed papers and several books, including the International Union for the Conservation of Nature’s Guidelines for Protected Areas Legislation (Lausche, 2011), Legal Aspects of Connectivity Conservation – A Concept Paper (co-author, 2013), and the E-book, Building Capacity on Protected Areas Law and Governance – 12 Training Modules (co-author, 2015). Dr. Lausche is currently the Director of the Marine Policy Institute at Mote Marine Laboratory and Aquarium, a non-profit marine science research organization based in Sarasota, Florida, United States of America. The organization participates in science projects worldwide, including the Caribbean. Her career includes staff positions at the World Bank, World Wildlife Fund-US, U.S. Environmental Protection Agency, and the U.S. Congressional Office of Technical Assessment. Throughout her career, she has been active in the Environmental Law Programme of the International Union for the Conservation of Nature (IUCN), and continues those ties as a member of IUCN’s Law Commission and World Commission on Protected Areas. Dr. Lausche has undertaken technical assignments in the Wider Caribbean Region, including assessment of the environmental law frameworks of the eight members of the Organisation of Eastern Caribbean States, provided technical assistance for drafting of new national parks legislation and regulations in the British Virgin Islands, and prepared draft biodiversity guidelines for the Protocol Concerning Specially Protected Areas and Wildlife, United Nations Environment Programme-Caribbean Environment Program. Dr. Lausche’s non-profit work in the Caribbean includes serving on the board of directors of the Island Resources Foundation. Dr. LaVerne Ragster is a retired Professor of Marine Biology and President Emerita of the University of the Virgin Islands. Dr. Ragster has conducted research and training in the areas of algal physiology and natural resource management, presented and published in the areas of plant physiology, natural resource management and training, and obtained training and practical experience in institutional and leadership development over a 35 year span. Dr. Ragster maintains her scholarly work primarily through assignments with the Caribbean Exploratory (NIMHD) Research Center at the University of the Virgin Islands, where she focuses on climate change and public health. Dr. Ragster has served the U.S. Virgin Islands, United States of America, and Wider Caribbean Region in a number of leadership roles. In academia, she served at various times as Sub-Secretary General for the Association of Caribbean Universities and Research Institutes, as the Coordinator of the Consortium of Caribbean Universities for Natural Resource Management, as Chair of the Board of the University Consortium for Small Island Developing States, and on commissions and programs of the American Council on Education and the National Association of State Universities and Land Grant Colleges. She has been an active member of a number of local and Caribbean regional civil society organizations, and has served on the board of directors of regional organizations such as the Caribbean Studies Association, Caribbean Natural Resources Institute, Caribbean Conservation Association, Island Resources Foundation, The Nature Conservancy, and Clean Islands International. Dr. Ragster has served on national committees, such as the National Environmental Policy Commission of the Congressional Black Caucus Brain Trust on Environmental Justice, the National Marine Fisheries Advisory Committee, and the U.S. Integrated Ocean Observing Systems Advisory Committee. She has worked in the Wider Caribbean Region with the United Nations Environment Programme-Caribbean Environment Programme, the Organisation of Eastern Caribbean States, and as the U.S. Virgin Islands representative on the Caribbean Council for Science and Technology.